As material costs continue to rise, companies need to reduce operating costs while maintaining high quality standards. To ensure that every aerosol can produced is within specifications, it is important to use accurate and repeatable measurement instruments that can monitor the product quality, locate any potential problems, record the measurement data and predict future trends. Analog-based gauges are no longer sufficient in today’s competitive environment. These gauges won’t tell you which side of the can buckled first, and they can’t monitor all three pressure points in one run (the two buckling pressures and the burst pressure). If you want to record and analyze the data, you need to write down each measurement and enter the data manually in to an SPC program. Quality By Vision’s new Aerosol Buckle & Burst Gauge is an accurate, user friendly and affordable system that automatically measures, analyzes and records all pressure points on any size aerosol can. The system displays the pressure and volume graphs and allow the operator to see the exact point where the can buckles (dome reversal) and bursts – automatic detection determines the exact point where the top or bottom dome buckle. The software provides easy to read information on the can and records the data in the built-in Symphony SPC system. 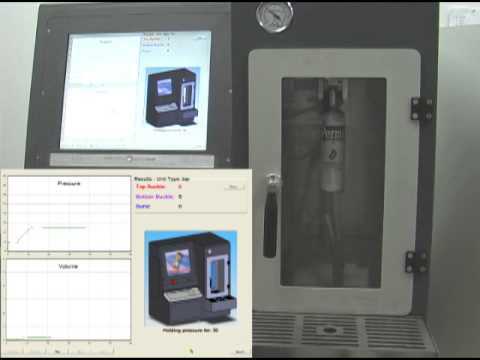 There is no operator influence on the measurement process and the pressure test scenario (when to raise pressure, by how much, how long to hold, etc.) is completely programmable. During the measurement, the operator can see the pressure and volume graphs as well as pressure level and other details. Reports and graphs can be saved or exported to SPC systems. Detection: Automatic with optional operator manual override!